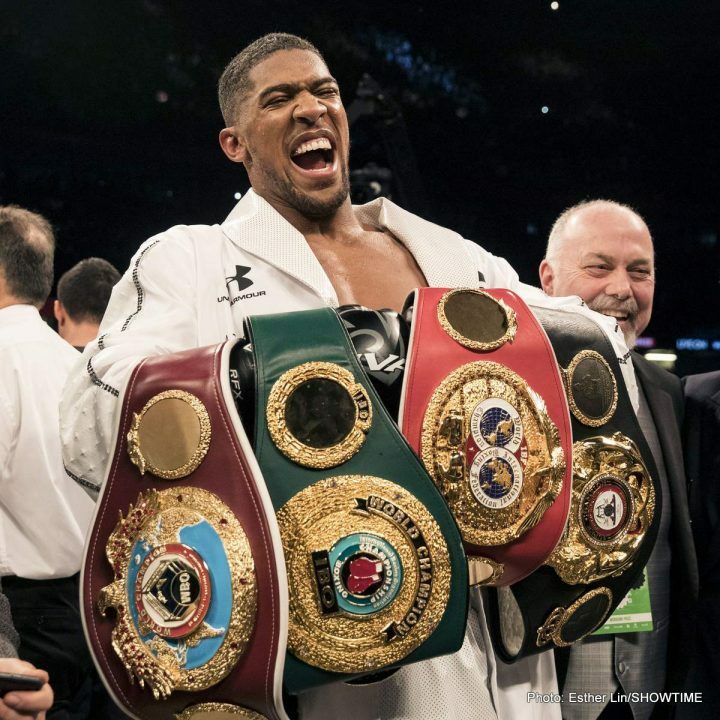 By Scott Gilfoid: Anthony Joshua’s promoter Eddie Hearn is interested in having AJ’s unification fight against WBC heavyweight champion Deontay Wilder on DAZN in October or November in Cardiff, Wales. Hearn told IFL TV that he’s interested in potentially putting the Joshua-Wilder fight on DAZN. Why Hearn wants to stage Joshua vs. Wilder in Cardiff, Wales is unknown. This would be the third consecutive Joshua fight that would be taking place in Cardiff. The last two fights have had shaky officiating by the referees, which has favored Joshua. The last Joshua fight against former WBO heavyweight champion Joseph Parker saw the referee preventing inside fighting. In Joshua’s fight before that against Carlos Takam, the referee stopped the fight prematurely in Cardiff. I don’t know why Wilder would agree to Joshua in Cardiff after what happened with his last two fights. That would be like Wilder agreeing to lose the fight. Hearn says if Wilder messes around in not signing the contract, then he’s going to go ahead and match Joshua against his WBA mandatory Alexander Povetkin next and lead Deontay on the side of the road. “If they’re going to mess around on us, then we’ll fight Povetkin in September, because we have to fight him at some time,” Hearn said to IFL TV. I don’t what Hearn is blabbering about. If Wilder doesn’t sign the contract for the fight right away, then it tells me that he doesn’t see it as being a good deal. In other words, it would need to be sweetened for him to take the deal. Hearn should know right away whether Wilder is going to sign for the fight. Instead of guessing whether Wilder will sign, he should increase the offer to make sure he signs. Hearn putting Joshua vs. Wilder on an unproven platform like DAZN for a pay-per-view fight would be an insane move. If Wilder has any say so in the deal, he should tell Hearn to use someone else to experiment with to try ad drum up subscriptions to his DAZN. It sounds like Joshua is going to wind up facing Alexander Povetkin next rather than Wilder, because all this talk about wanting the fight on DAZN isn’t going to work out for Deontay. Joshua already said he won’t fight Wilder in the U.S for the first fight, and there’s no guarantee that the second fight will be in the U.S either. It’s quite possible Joshua will never fight Wilder in the U.S, which is reason enough for the fight never to happen. If Wilder stood by his principals, he’d tell Joshua that the only way the fight takes place between them is if the second fight is in the U.S.